When Pfizer first introduced Zoloft (sertraline chloride) to the U.S. market in 1999, the medication was advertised as a safer alternative to competing antidepressants like Prozac, which allegedly had more side effects and severe withdrawal symptoms. There was little mention of Zoloft side effects, and the medication quickly shot to prescription drug stardom. By 2005, Zoloft was the most popular antidepressant prescribed in the United States. During the first six years of its tenure on the U.S. market, almost 30 million prescriptions for Zoloft were written. And by that same year, the drug was not only the most popular antidepressant in the U.S., but also the sixth-most prescribed brand-name medication in the entire country, grossing almost $2.6 billion dollars. But missing from the equation were warnings of adverse side effects, especially among children of women who took Zoloft during pregnancy. In fact, soon after the medication hit U.S. shelves, reports of side effects began rolling in: suicide and suicide ideation, worsening depression, and a host of birth defects, including clubfoot, craniosynostosis, heart defects, omphalocele, and persistent pulmonary hypertension of the newborn (PPHN). 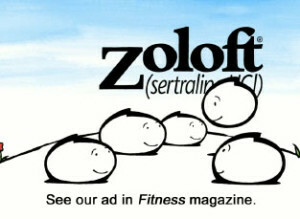 Zoloft belongs to a group of antidepressant medications known as selective serotonin reuptake inhibitors (SSRIs). The SSRI drug class has been popular since the early 1980s, since they generally have fewer, less severe side effects than other types of antidepressants. Today, SSRIs are the most prevalent type of antidepressant in the United States. The functionality of SSRIs is apparent in their name: selective serotonin reuptake inhibitors. Serotonin is a neurotransmitter that is believed to affect our moods, sleep and learning processes. Neurotransmitters, including serotonin, send messages between brain cells. SSRI medications inhibit the reuptake, or absorption of serotonin. This is thought to improve mood, which in turn can help alleviate the symptoms of depressions. Zoloft is most often prescribed to treat major depressive disorders (MDD), a condition that affects almost 7% of all adults in the United States. MDD is a very serious mood disorder and if left untreated, reportedly has a suicide rate approaching 20%. Zoloft may also be used in the treatment of obsessive-compulsive disorder (OCD), panic disorder, post-traumatic stress disorder (PTSD), premenstrual dysphoric disorder (PMDD), and social anxiety disorder. The FDA labels Zoloft as a category “C” drug, which means that animal studies have demonstrated harm to a fetus, but no corresponding human studies exist. Note that a lack of similar human studies does not suggest that human mothers would not experience similar harm to their fetuses; in fact, research has shown that women who take SSRI medications including Zoloft after their 20th week of pregnancy are more likely to have babies with persistent pulmonary hypertension of the newborn (PPHN). PPHN is fatal to approximately 10% of newborns who have been diagnosed with the condition. Additionally, women who take SSRIs during pregnancy are also twice as likely to give birth to babies with heart defects. SSRI medications are also linked to anencephaly, a fatal birth defect that occurs when the baby’s brain and skull fail to develop. Due to the dangers of Zoloft and pregnancy, and the heightened risk for newborns to suffer birth defects, it is important to speak with a doctor if you are pregnant, may become pregnant, or are trying to conceive. In addition to other Zoloft side effects, taking the drug while pregnant can also put your child at risk for painful withdrawal symptoms. Clubfoot: Also known as congenital talipes equinovarus (CTEV), occurs when the foot is malformed, facing downward or twisting inward. Requires correction. Craniosynostosis: Skull deformation that can affect brain development and growth. Can cause developmental delays, seizures, and other difficulties. Indicates surgical correction. Heart Defects: Atrial septal defects (ASD) and ventrical septal defects (VSD) are holes in the chambers of the heart. Open-heart surgery may be required. May be fatal. Omphalocele: Umbilical hernia, meaning that certain internal organs (intestines, abdominal organs, possibly the liver) form outside the body. Requires corrective surgery. Persistent Pulmonary Hypertension of Newborn (PPHN): Serious newborn lung disorder resulting in cyanosis, heart murmur, low blood-oxygen levels, rapid breathing (tachypnea), rapid heart rate (tachycardia), and respiratory distress. Long-term effects include permanent lung damage, seizures, developmental and neurological delays, and hearing problems. Fatal in 10% of cases. Though SSRI medications, including sertraline, have fewer and less severe side effects than other antidepressants, they are still linked to serious issues. Zoloft has been subject to several FDA warnings and medical studies regarding its safety and potential risks. October 2004: Black-box warning added regarding increased suicide risks for children taking Zoloft. July 2006: Public health advisory for serotonin syndrome, a potentially fatal overdose of serotonin. This can occur when Zoloft is used in conjunction with Triptan medications, used to treat migraines. July 2006: Public health advisory regarding the possibility of Zoloft birth defects, specifically PPHN. May 2007: Suicide risk in children upgraded to apply to all SSRI users under age 25. December 2011: FDA Drug Safety Communication to inform doctors and the public that the link between Zoloft and PPHN is still under review. Millions of people take Zoloft everyday, and in the absence of stricter guidelines, many of those patients are women – women who are pregnant or are trying to get pregnant. And some of these women may experience the catastrophic consequences of Zoloft birth defects. These women and their families have grounds for a Zoloft lawsuit: claims that manufacturer Pfizer did not provide adequate warnings concerning Zoloft and pregnancy. Currently, federal claims alleging birth defects caused by Zoloft have been consolidated in multidistrict litigation, or MDL, in the U.S. District Court for the Eastern District of Pennsylvania. More than 250 plaintiffs are currently involved in the MDL, and it is possible that many more will join. Some patients have taken the SSRI and experienced other Zoloft side effects, like increased depression and suicidal thoughts. These side effects can also have debilitating implications and serve as grounds for a lawsuit against Pfizer.